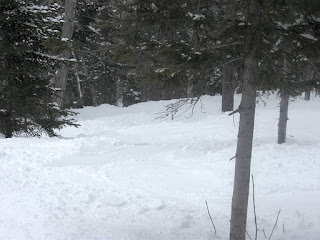 As we get into the ski season, I will be posting reviews on ski mountains in Maine that we have visited. These reviews will be about the on-hill skiing experience with a family focus day-trip ski event in mind. Since we typically bring our lunch no reviews of the mountain lunch dining options. I want you to be able to get a sense as a family how this mountain would be suited for you. I will use a school ranking system handing out A+'s to F's in the categories below. For the day-tripper, Sugarloaf is a park and shuttle mountain. There is no drop off of equipment at the lodge and everyone needs to take a shuttle. They have a pretty good supply of parking but on the really busy days parking along the access road is required for late arrivals. Regular shuttles ferry skiers up to the day-lodge from the parking lots. You need to plan a bit of time for a shuttle ride into your trip time. The day lodge is a good size but has a bit of an industrial feel. The main room is pretty big and one can move around well even on the busy days. Its another place where arriving early and eating lunch early is to your benefit. Ticketing is on a different level than the main rooms which can be kind of a pain. I think Sugarloaf could benefit from an additional day lodge somewhere else on the mountain but for the most part the lodge is adequate. I give a grade of a B- for parking access and a B- for the day lodge. A typical weekend or holiday day will mean big crowds of 'Sugarloafers' rippin it up. However, Sugarloaf has a pretty good trail system to handle the crowds. Most trails provide long runs where you can find room to ski. In the terrain section below I will give hints to where to go to beat the crowds depending on your ability. Last year, Sugarloaf replaced the Spillway chair with a new Quad fixed chair called Skyline. Spillway was notorious for wind-holds but now with the new lift, Sugarloafers should have a more reliable lift to the center intermediate and expert terrain. Sugarloaf is also served by two high speed Quad lifts, a T-Bar and numerous fixed grip lifts. The Superquad can get some crazy long lines mid-morning on a busy day, but the lift system does a good job getting people up on the mountain. I give a grade of an B for trail crowding and a B+ for lift infrastructure. For the brand-new skier, Sugarloaf's terrain is a bit limited. There is beginner terrain right above the lodge area, but this also where all the skiers from upper mountain dump out so it can be a bit of a zoo sometimes. The beginner trail continues down behind the lodge where it opens up a bit. Advanced beginners can hop on the Whiffletree lift which services some blue and green terrain. There is a bit of a pitch up top off this lift but flattens out nicely and can be a lot of fun for the new skier. Another area an advanced beginner can hit up is West Mountain. This is typically only open weekends during mid-season. West Mountain is a nice long run that is not visited by many people at all. Mostly the homeowners on this side use the trail to access their residences. But it is a great place to ski! The chairlift back up is long and slow, but you can have a lot of fun there. I give a grade of a B- to the beginner terrain. Sugarloaf has some great blue cruisers. Tote road is one of my favorite trails in Maine. From the top, a 3 mile run that twists and turns, provides challenges and is really enjoyable to ski. From the summit, upper and lower Timberline are great trials with great scenery. Back in my high school days I learned to ski off the Bucksaw chair, with Scoot and Glancer logging many runs. Bucksaw is a slow old lift, but is an option when the lines are crazy at the Superquad. 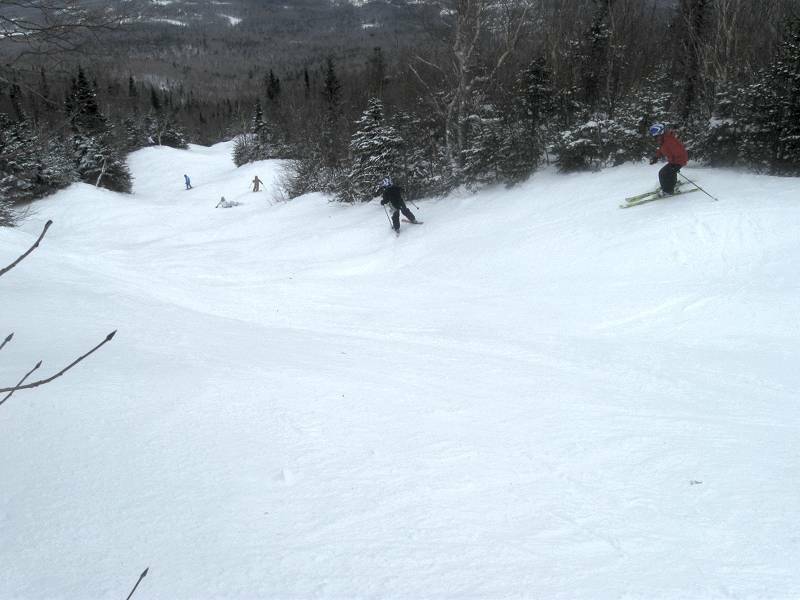 Lots of great options for the intermediate skier at Sugarloaf. I give a grade of a A to the intermediate terrain. Sugarloaf offers a nice variety of terrain parks. My kids find Sugarloafs Terrain parks really challenging with some monster hits, but there is a nice entry-level park in the Whiffletree chair area. Its fun to watch the skiers from CVA rock the features in the park. The vibe seems pretty good in these parks. I give a grade of a A- to the terrain parks. If you want steep groomers that make you gulp before skiing it, they have it. If you want steep, natural bump runs, they have it. If you want summit snowfield skiing, they have it. You will want to ski the groomer expert runs early as they will get icy in heavy traffic, but the expert skier will not be unhappy at Sugarloaf. Best terrain options in the east for experts. Nuff said. I give a grade of an A+ to the expert terrain. I have skied Sugarloaf quite a bit over the past 5 years, but I have not really hit a great glade day at Sugarloaf. I seem to always visit right after some ice-up rain event, so my options have been limited in the trees. They have glades all over the place and with their expansion to Bracket Basin I bet a pass holder will probably not ski the same line twice in a season. I need to get to Sugarloaf on a mid-week powder day. I give a grade of an A to the gladed terrain. Visit the resort website for the latest pricing information but a day trip to Sugarloaf is not cheap. As with any resort, bundling tickets with lodging usually saves some coin. There are some lower-mountain only lift ticket options. Maine families with 5th, 6th and 7th graders should pick up a Winterkids booklet to get free child tickets with paid adult tickets. Maine families can also take advantage of Sugarloaf's Maine Resident Specials. Maine Family Sunday is a favorite of ours and playing hooky from work for Maine Resident Wednesdays is always fun! I give a grade of an B for day-trip lift ticket pricing. .
Sugarloaf is a great Maine mountain. There is a certain community and vibe you get from the skiers and staff at Sugarloaf... Being a 'Sugarloafer' they call it. The latest clothing styles and equipment are certainly present on the mountain, but you still see the occasional old-schooler out on the slopes and he/she is respected. On weekends and holidays, the lines can get long and the trails crowded, but the terrain is outstanding. Sugarloaf is a classic Maine skiers mountain. Well worth the trip! Overall - I give Sugarloaf a ranking of an A-. Look for more ski mountain reviews in upcoming posts. Feel free to comment on what you think about Sugarloaf below. I am writing a post about Sugarloaf in snowskiguru.com. I will put a link to your page in the post. I presume that the most used chairlifts are whiffletree superquad combined with king pine, and sugarloaf superquad combined with timberline, it is that correct? Wich is the lift you like the most at Sugarloaf? I wonder if the snowfields in the front side are extreme ski or just black slopes but no so difficult. And the back side? How is skiing Bracket Basin and Burnt Mountain? You have to walk a lot? And the eastern territory is too flat? What happen when the snow is hardpack? What is your favourite slope at Sugarloaf? And the worst thing about Sugarloaf?